Following a sell-out run at The Watermill Theatre in Newbury “CALAMITY JANE” has embarked on a national UK tour coming to the King’s Theatre Glasgow from Tuesday 16 until Saturday 20 June 2015. 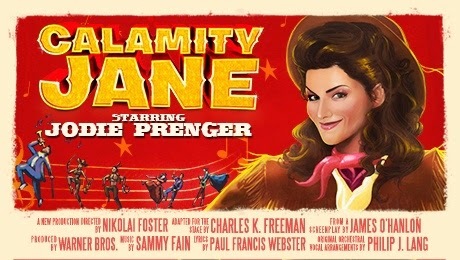 “CALAMITY JANE” stars Jodie Prenger in the title role,Tom Lister as ‘Wild Bill Hickok, Alex Hammond as ‘Danny’ and Phoebe Street as Katie Brown. Featuring an Oscar nominated score that includes The Black Hills of Dakota, The Deadwood Stage (Whip-Crack-Away), Just Blew in from the Windy City and the award-winning song Secret Love, CALAMITY JANE is an audience favourite set to enthrall Glasgow this summer.